LONDON, October 4, 2011 – American performing right organization Broadcast Music, Inc. (BMI) celebrated Europe and Asia’s premier songwriters, composers and music publishers tonight during its annual BMI London Awards. Guests filled London’s Dorchester Hotel, Park Lane to toast the past year’s most-performed songs on U.S. radio and television. Songwriters and composers honored at the event are members of European and Asian performing right societies and are represented in the U.S. by BMI. 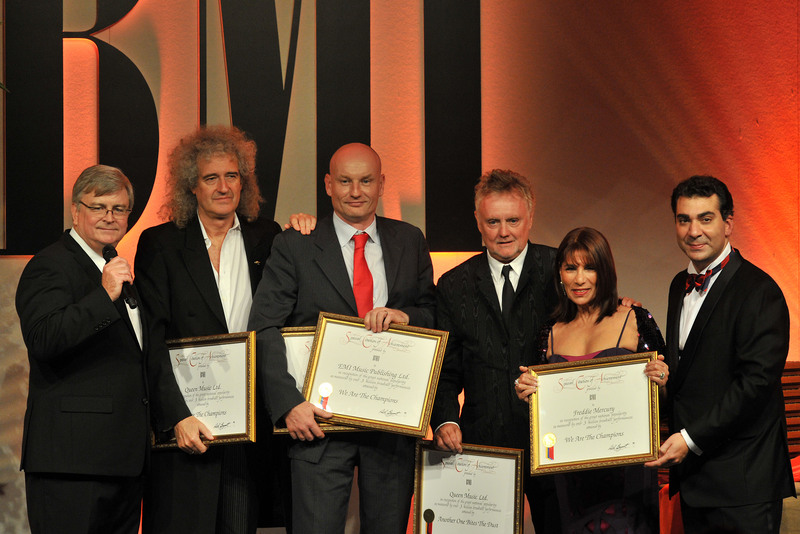 Legendary rock band Queen were honored as BMI Icons. All songwriters, vocalist Freddie Mercury, guitarist Brian May, drummer Roger Taylor and bassist John Deacon join a list of previous honorees that includes Donovan, Peter Gabriel, Don Black, Bryan Ferry, Ray Davies, Van Morrison and more. The Script’s “Breakeven” earned the BMI Robert S. Musel Award for Song of the Year. Andrew Frampton (PRS) and band members Daniel O’Donoghue (PRS/IMRO) and Mark Sheehan (PRS/IMRO) co-wrote the song, which was published by BMG Chrysalis (PRS). “Breakeven” is from the Irish band’s top-selling eponymous album. Taio Cruz’s “Break Your Heart,” co-written by Fraser T. Smith and published by BMG Chrysalis (PRS), garnered the College Song of the Year win. “Stereo Love,” written and recorded by Romanian musician Edward Maya (PRS/UCMR-ADA) and Vika Jigulina (PRS), claimed Dance Song of the Year. The infectious club hit is published by Media Services International (UCMR-ADA). In addition to celebrating the writers of most-performed songs in the U.S. during the past year, BMI presented awards to the composers of the most-watched and highest-grossing television programs and films; and the songwriters behind hits that have generated more than three million U.S. radio and television performances. Del Bryant, BMI President & CEO; Phil Graham, BMI Senior Vice President, Writer/Publisher Relations; and Brandon Bakshi, Executive Director, Writer/Publisher Relations, Europe & Asia hosted the ceremony. Honorees have accumulated substantial performance totals—from three to ten million—in U.S. radio and television. Robert Mellin Ltd./EMI Music Publishing Ltd.
E.C. Music Ltd./Warner-Chappell Music Ltd.